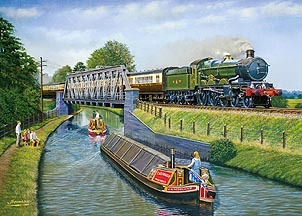 1947 was the last summer of private ownership of British transport, as the railways and waterways were nationalised on the 1st of January 1948 becoming British Railways and British Waterways. On a sunny day in 1947, Great Western Railway ‘Castle’ class 4-6-0 No. 5080 ‘DEFIANT’ makes leisurely progress as it crosses the canal, watched by a family group on the towpath.